In case you wanted to know more about me as a person, this is what I do when I’m bored. 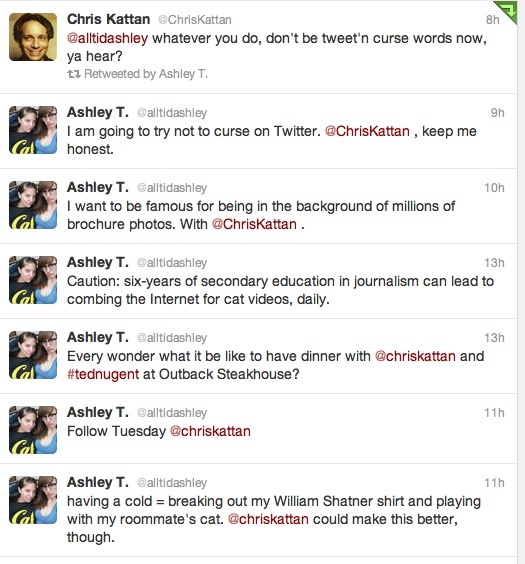 Also, Chris Kattan is a cool dude. And a happy Wednesday, and Thursday to you. super awesome, I want to rewrite his Wikipedia article, though. He deserves better. I’m goofy. Still trying to figure Twitter out. Night at the Roxbury and Undercover Brother were highly underrated movies! I can’t believe nobody ever rented those movies while I was working at the video store! Finally! congrats on the Chris Kattan victory…. who’s next? everything comes to me in random moments of inspiration, so, I don’t know, but it’ll be epic. I don’t twitter. Do I want to put birds out of a job? OHhhh, you mean TWITTER. No. Don’t know how to do that either. Have a nice day. Hahaha, so, did u manage not to swear on twitter? What would a William Shatner shirt consist of? Would it allude to his role in American Psycho 2?